Ever since Martha Stewart featured Fireworks Cookies on the cover of her magazine a few years ago, these beauties have expoded over the internet every July. My vegan version is food allergy friendly and very forgiving to those of us who are not up to the Martha standard of cookie decorating. You can use any flavor you prefer for the jam and citrus zest, but for this batch I used my favorite combination, raspberry and lemon. Preheat oven to 350°F. Cut parchment paper to size of cookie sheets. Measure dry ingredients into a medium bowl and whisk together, then set aside. Cream margarine with sugar until light and fluffy. Mix in jam or jelly, vanilla extract and zest (if desired). Slow mixer and gradually add dry ingredients until completely combined. Spread out one of the pieces of parchment paper on a flat surface. Place about a quarter to a third of the dough on it. Cover remaining dough with plastic wrap or place in plastic bag to keep from drying out. Flatten the dough on the parchment paper into a thick disc by hand, then cover it with a piece of wax (not parchment) paper. While keeping the wax paper in place on the dough, use a rolling pin to roll it out to 1/4 inch thickness. (You'll be much more successful making uniform cookies that bake evenly by using a rolling pin with spacers.) Peel off the wax paper and use a large circle cookie cutter to cut out shapes with space between them, but leave them in place on the parchment paper. Use an offset spatula (preferred) or butter knife to remove the dough from between the cookies. Gently slide the parchment paper onto a cookie sheet. The leftover dough may be recycled as many times as needed to use all the dough, since additional flour is not added to roll it out. Bake cookies for 10 to 12 minutes and the edges just begin to lightly brown. Remove from oven and allow cookies to remain on sheet for 5 to 10 minutes to firm up before removing to rack to complete cooling. By using every scrap of dough, I made 28 cookies with a 3 inch cookie cutter. Once cookies are completely cool, decorate with royal icing. Combine Egg Replacer, water and lemon juice in a medium bowl and whisk vigorously until frothy. Add powdered sugar and stir until smooth. The icing should be fairly stiff at this point. If not, gradually add additional powdered sugar and stir until a spoon pulled across the bottom of the bowl will very briefly allow the bottom surface to be seen before the icing fills it in. Fill either a squeeze bottle or piping bag with a #2 or #3 tip halfway with icing. Cover remaining icing with plastic wrap to keep it from crusting over. Draw a circle about 1/4 inch in from the outside of each cookie. While the outline is drying, thin the remaining icing to a more liquid consistency for flooding by adding a quarter to a half teaspoon of water or lemon juice at a time and stirring. (I prefer lemon juice, so that the icing isn't tooth achingly sweet.) When the icing pours off a spoon at about the same rate and consistency as honey, pour about 1/3 to 1/2 cup icing into two small bowls (each). Stir blue and red food coloring into the small bowls until the desired shades are reached. Pour white, red and blue icing into squeeze bottles. (The white one will need refilling as you go.) Begin by flooding outline with white icing, then use a toothpick to spread until the entire circle is filled. 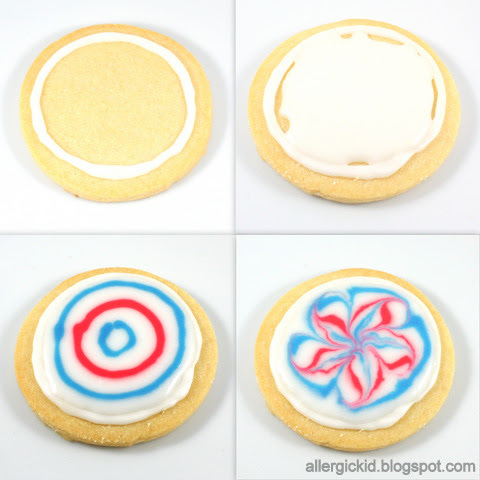 Immediately make concentric circles using the blue and red icing in whater pattern you prefer. Draw a pattern with a toothpick by drawing lines toward the center of the cookie, or alternate with lines going back out, or (my favorite) draw petal shapes to make a pinwheel, as shown above. Bake at 350 has a very nice tutorial for making these, but be warned that the vegan icing will never have the nice crisp edges that her egg based royal icing does! Allow cookies to harden overnight, or possibly longer if like me you live in humid Florida during the even more waterlogged monsoon season. It's been a while since I last posted, so I've got quite a few tidbits to share with you. There have been two big changes to the blog itself. 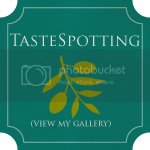 In the past I have refused to have any kind of advertising, since my goal for this site is to share recipes and my family's experience in living with food allergies. Recently I became an Amazon Associate, so that if you click links from my blog to Amazon and make purchases there, I will earn a teeny tiny commission without any additional cost to you. I promise not to link to any items that I do not actually use myself. I don't expect to make much money, but hopefully it will help offset some improvements to the blog and to my photography equipment! Second, I have had to enable comment moderation, since I've been flooded by spammers linking back to sketchy supplement and "health" websites. Please, I really do want to hear from you, so don't be discouraged if your comment isn't approved quickly! I probably just haven't had a chance to sort through the spam yet! One (kind of awesome) reason for my newfound spammer magnetism, is probably this Blogger Profile of The Allergic Kid on the Food Network's Healthy Eats site a few months ago. I'm a little late in sharing it, but still too excited about it not to! Trust me to spend an interview about healthy food talking about pizza and cookies, though! Mylan is also asking you to "Show us your Epi-pens!" by sending in photos of you or your child holding the Epi. 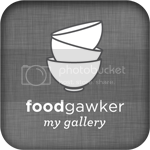 For each person who sends in a photo, they are donating $25 to a food allergy non-profit. It's a quick and easy way to make a contribution. See if you can spot the photo of this handsome young man in the mosaic! Wonderful Wednesday at Sweet to Eat. Disclosure: I was not compensated by Mylan Specialty for this post, but have attended a blogger conference as their guest in the past. These are fabulous! Thanks so much for linking up to the 4th of July Linky Party & Happy independence Day! My grandson is the cutest ever. So cute Libby! I've always been terrified of cookie decorating, but you make it look so easy. Do you use any food coloring that is natural or just the regular store bought? I've been looking to try something natural, but am not sure what's good. Thanks Mom, I mean ANONYMOUS, he really is a cutie pie! Alisa, thanks! I'm afraid it's the plain old grocery store kind of food coloring, though I have used beet juice to make a really pretty magenta. I can't even use the Wilton colors, because of peanut x-contamination. I haven't tried looking at the natural ones, but would absolutely love to hear back from you if you find a food allergy friendly brand. What a great find! I have never been able to figure out how to make Vegan royal icing. I'm sooooo excited! Even though my son has out grown his egg allergy, I like to bake for my egg allergic friends.